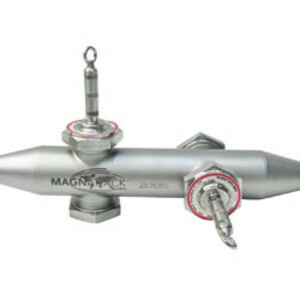 The Magnattack RE80 HT Liquid Pressure Pipeline Separator (PPS) is engineered to efficiently extract magnetic fragments (including work-hardened stainless-steel and magnetic stone) from food lines such as soups, chocolate, sauces, dairy products and other liquid products. The system features a single or double set of powerful RE80 HT +11,000 gauss magnet elements, which intercept the flow of product and securely retain foreign metal contaminants. The PPS was designed following customer feedback relating to difficulty in handling bulk liquid magnet systems and the time taken to clean multiple finger pot magnets/liquid trap magnets. After a period of R&D and testing, the Liquid Pressure Pipeline Magnet was found to be a more hygienic and efficient magnetic separation system. The system can be used in places where conventional liquid trap magnets are unsuitable. The magnet elements are easily removed for cleaning. The Liquid Pressure Pipeline Magnet can be used for both protection of critical processing equipment and final product security. 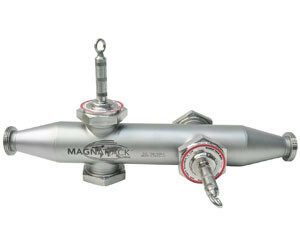 I am interested in Magnattack RE80 HT Liquid Pressure Pipeline Separator .